Quintus Horatius Flaccus, (December 8, 65 B.C.E. - November 27, 8 B.C.E. ), known in the English-speaking world as Horace, was the leading Roman poet during the reign of Augustus Caesar. Horace was known in his own time primarily for his Odes, a series of poems written in imitation of ancient Greek classics. The Odes display Horace's mastery of ancient verse-forms, and in particular showcase his unique ability to create beautiful poetry in Latin, using difficult forms that were designed for the language of the ancient Greeks. Horace's Odes are considered some of the most beautiful works ever written in Latin, and his mastery of the language and the almost musical beauty of his lines has made him one of the most frequently studied and imitated Latin writers of all time. Unfortunately, however, the lyrical beauty and technical mastery of Horace's Odes have proven incredibly difficult to translate and, following the decline of Latin as a scholarly language, the Odes have fallen further and further into desuetude (no longer used). Today, Horace is primarily known for his instructional poetry, particularly the Epistles, which contain what is probably his most influential work, a verse-essay on the art of poetry entitled Ars Poetica. In this work he stresses, among other things, his belief that poetry must be "wholesome"— that is, educational—in addition to being beautiful, arguing that a thorough understanding of the technical aspects of poetry is necessary in order to be a truly successful poet. The Classicist movement that would emerge in the [[Renaissance[[ through Petrarch and Dante and, later, re-emerge in eighteenth- and nineteenth-century Europe would esteem Horace as the greatest poet of all of ancient Rome next to Virgil. Generations of later poets would be inspired by Horace's rectitude, his devotion to tradition and to form, and his overwhelming concern with the importance of moral instruction in poetry. Horace is, undoubtedly, one of the more difficult poets of the ancient world for the modern-day reader to tackle; but, given the effort, he is easily one of the most rewarding poets of his era. 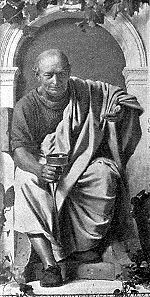 After the assassination of Julius Caesar, Horace joined the army, serving under the generalship of Brutus. He fought as a staff officer (tribunus militum) in the Battle of Philippi. Alluding to famous literary models, he later claimed that he saved himself by throwing away his shield and fleeing the battlefield. When an amnesty was declared for those who had fought against the victorious Octavian (later known as Augustus), Horace returned to Italy, only to find his estate confiscated and his father dead. Horace claims that he was reduced to poverty. He nevertheless had the means to purchase a profitable life-time appointment as an official of the treasury, which allowed him to get by comfortably and practice his poetic art. Horace was a member of a literary circle that included Virgil and Lucius Varius Rufus; they introduced him to Maecenas, friend and confidant of Augustus. Maecenas became his patron and close friend, and presented Horace with an estate near Tibur in the Sabine Hills, contemporary Tivoli. Upon his death bed, having no heirs, Horace relinquished his farm to his friend and Emperor Augustus, to be used for Imperial needs. His farm is there today and remains a place of pilgrimage for literary-minded tourists. Horace is considered by classicists to be, along with Virgil, among the greatest of the Latin poets. Dulce et decorum est pro patria mori "It is sweet and fitting to die for one's country"
aurea mediocritas the "golden mean"
"Let him who has enough wish for nothing more." "It is your concern when the wall next door is on fire." "One has half the deed done who has made a beginning." With frost, the streams have ceased to flow. Grey ash and cypress rock and sway. Perhaps the finest English translator of Horace was John Dryden (1631-1700), who successfully adapted most of the Odes into verse for contemporary readers at his time. These translations are favored by many scholars despite some textual variations. Others favor unrhymed translations. John Conington, professor of Latin at Oxford University, who mentioned how quotable Horace was, saying "He condenses a general truth in a few words, and thus makes his wisdom portable." Ars Poetica was first translated into English by no less than Queen Elizabeth I. ↑ Translation by Charles Stuary Calverley, from Verse and Translations c. 1862. This page was last modified on 13 January 2018, at 23:56.